What a fantabulously creative project. The ‘language’ of trees. 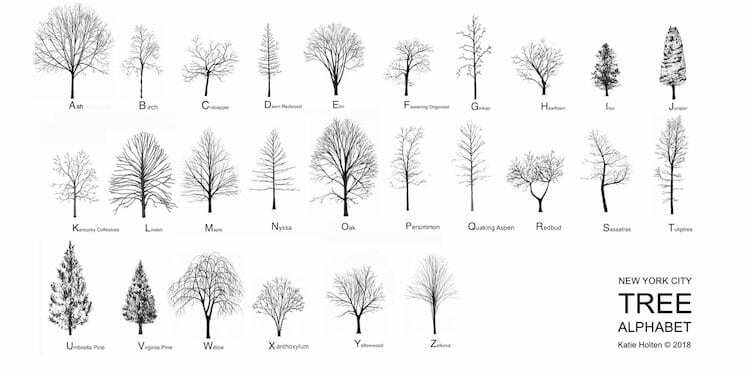 This is so cool– a tree alphabet. I’m sharing this from Beth’s site. I think it’s quite cool, Beth. Would I be able to learn this tree alphabet by sight? It would take some doing, that’s for sure. So creative! Who doesn’t love trees? I tried to “like” but nothing happened. I love this. What a lovely idea — and what a brilliant way to connect NYC residents with the bits of nature that surround them! Oh wow I love trees and I found this book about how to draw them wow I’m inspired. Fascinating. When I was a kid, my best friend and I often exchanged messages in code. All kinds of codes. Sending messages with the tree font would be a great way to play with “coded” messages while learning to recognize all the different trees.